Merging GIS data such as road features from multiple sources is often a time consuming and tedious process. 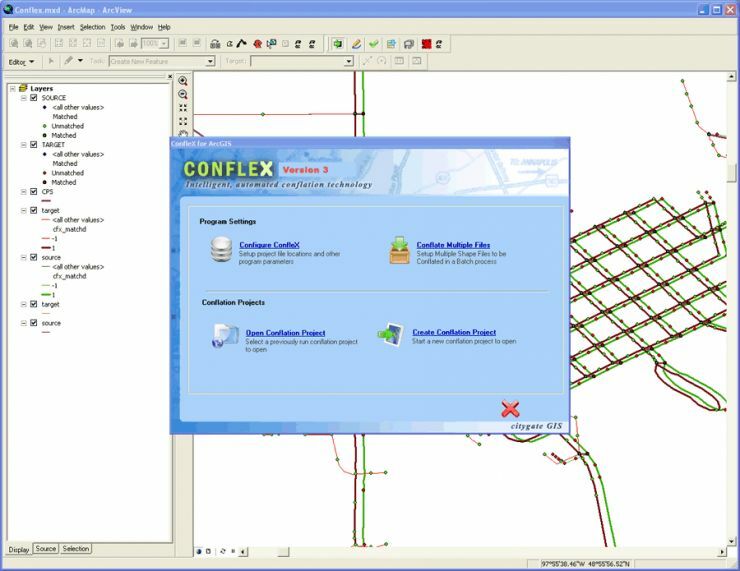 ConfleX is a first of its kind conflation tool which uses artificial intelligence (AI) technology to automatically match GIS feature from multiple data sources and allow for transfer attributes. Unlike traditional Conflation software which use an iterative process of rubber-sheeting that requires extensive manual intervention, Conflex's AI Engine does not use rubber-sheeting and can perform matches without any user interaction. The source and the target maps need not overlay or be topologically identical. For each segment, the system's intelligence engine, generates multiple candidates for assignment. Each candidate is then compared with the source by looking at the individual line but also its connecting segments. Using this technique, ConfleX is able to achieve match rates of over 95% accuracy. Once the automated match process has been completed, a suite of interactive tools provide validation and manual edit tools.